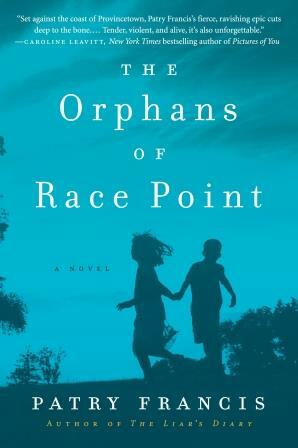 Not long ago, I reviewed (and raved) about Patry Francis’ book, The Orphans of Race Point. An emotional and character driven novel, Orphans explores the outer limits of friendship and the ties that bind. Today, I’m excited to have Patry on The Book Wheel to discuss the inspiration behind her book, how she wrote the character of a priest, and how she manages to put raw emotions onto the pages. If you’re interested in learning more about the book, read my review here, visit her author page, or follow her on Twitter @patryf. 1. Let’s start off with a broad question about The Orphans of Race Point. What inspired the book? In the novel, I write a lot about the compassion that radiates from Gus’s eyes and the special charisma that gives him. Those eyes were the first thing I saw when I began to imagine the novel. I also saw his woundedness. Almost immediately, I knew I wanted to explore how a devastating trauma affected a child and how that played out over the course of his life, creating a powerful empathy for the suffering of others. 2. The book is a story that transcends time and leaves the reader staggering with emotion. How do you tap into such raw human experiences and translate them to the page? 3. I read once that your husband in a minister – did his experiences factor into the development of Gus? My husband is a Deacon in the Catholic Church, and he works closely with the priests in his parish so that gave me a lot of insight into what Gus’s daily life might have been like. Ted also works in the medical field, and that may be his greatest ministry. I often meet people who tell me about the kindness he showed to them or to a family member when they were at their most vulnerable. Though it wasn’t anything conscious, I’m sure that influenced me, particularly as I wrote about Gus’s hospital work. 4. I also read that you’re a mother to four kids. How do you balance your undoubtedly busy life as a mom with being an accomplished writer? I wanted to be a writer ever since I was nine years old. It was a dream I always took seriously, even when my kids were little. In the early years, I focused on poetry and short stories, but there was never a time when I wasn’t working on something. I had a desk in the basement next to the laundry area. In the evenings, when my husband was home, I would go down and work on my latest project while the clothes spun in the dryer. Fortunately, with a large family, there was always a lot of laundry to do! I also studied the markets and submitted my work regularly. Now that my kids are older, I don’t have to go to the basement to find quiet, but the discipline and determination I learned from that time continue to drive me. 5. I have to say it – we have both spent a good bit of time in Brockton, MA and the Cape. How much of the setting was based on experiences versus research? I was amazed when I heard you had family in my hometown! Though I left the city when I graduated high school, it remains a big part of who I am, and that seeps into everything I write. Though I did some research into the history of Provincetown, very little of what I learned made it directly into the novel. However, knowing about the shipwrecks and the adversity the community endured gave me a better understanding of their strength. For the most part, though, this story and its characters sprang directly from my love for the landscape on the Cape, and my admiration for the loyal, deeply family-oriented Portuguese fishing community. In many ways, they remind me a lot of the hardworking people who always looked out for their neighbors in Brockton when I was growing up.